I made it out to the Outer Banks in North Carolina. I’m staying at the Frisco National Park Campground right next to the beach. The trip so has been pretty wet but the sun is out today so I plan to see some sights. Above is a quick and dirty edit on a video of the coastline near where I am camped. After the rally, I stopped in Apex, NC and visited an old friend from my youth named Jason Emery. I got to meet his wife and kids and had quite a good time. Boys will be boys too. We played Madden Football on an Xbox 360 before the night I left. We split two games but technically, if there was a tie-breaker, I would of won because I had more total points. (jab-jab). Anyway, I am heading up to Nags Head and Kitty Hawk for the day. I hope to get some good pictures. Surfs up boys and girls!!!! Wednesday I will be riding down to Johnson City, TN for the BMW Motorcycle Owners Association International Motorcycle Rally. There, I will catch up with some friends, see some fun bikes and gadgets and do a little riding. 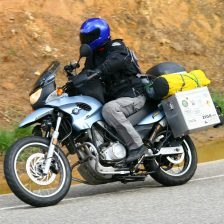 After the rally, I plan to ride east to Cape Hatteras, NC and camp near Buxton, NC. I’m not much for laying on the beach anymore but I do like taking a stroll during the morning sunrise on the beach. I’m sure I will be taking some pictures as usual and I will try to post some video too. Now I have to go pack.